"police have arrested and charged two suspects so far for break and enter and are now locked up in Police Custody." 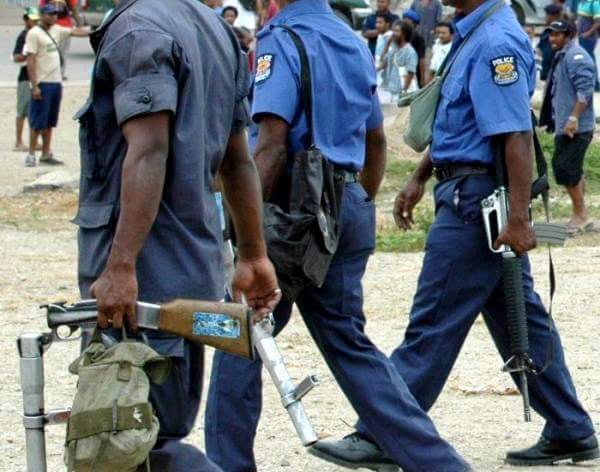 Manus police are yet to recover K58, 758.00 cash including stolen goods by thugs at the Papindo Supermarket last month. Manus Provincial Police Commander Chief Inspector David Yapu said some of the stolen items have been recovered by Police except the cash. PPC Yapu said police alleged that in the early hours of Thursday 14th January the suspects climbed over the fence near the Works Department office into the Papindo Supermarket premises. PPC Yapu said they allegedly used a bolt cutter and cut the padlock off the door at the back of the supermarket and gained entry into the supermarket. “the suspects then went to the Electrical Section of the shop and stole items such as boom boxes, speakers, memory cards worth K809.60 and made their way out through the same entry and escaped,” said PPC Yapu. Chief Inspector Yapu said police have arrested and charged two suspects so far for break and enter and are now locked up in Police Custody. He said the identities of several other the suspects involved in the incident are known to Police and will be arrested soon. He appealed to the community to assist Police in arresting those suspects on run and at large. “those are small group of hooligans causing problems in Lorengau town and recently involved in another Major Break Enter and Stealing at Pokapin Trading in Lorengau town last year”, said PPC Yapu. The PPC commended his CID members for good work and a job well done for the arrest of the two suspects.Both suspects appeared at the Lorengau District Court on today.